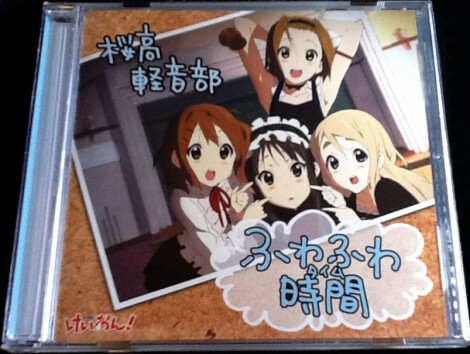 The first song written and performed by the Light Music Club, “Fuwa Fuwa Time” has become more or less the signature song of the band and to some extent the K-On! anime itself. 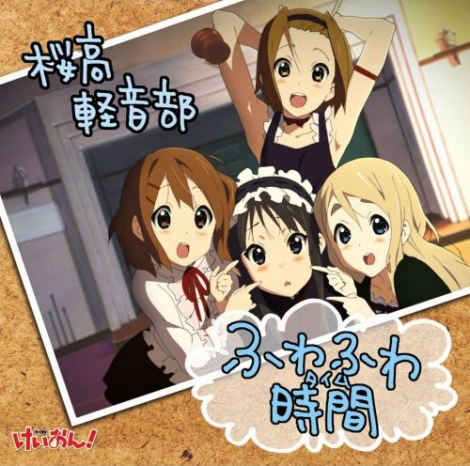 With lyrics “by Mio”, taken directly from Kakifly’s manga (and expanded upon for the anime) and the music composition credited in the anime to Tsumugi Kotobuki (but really by Hiroyuki Maezawa, composer of “Don’t Say “Lazy””) the song can be considered the classic K-On! song. 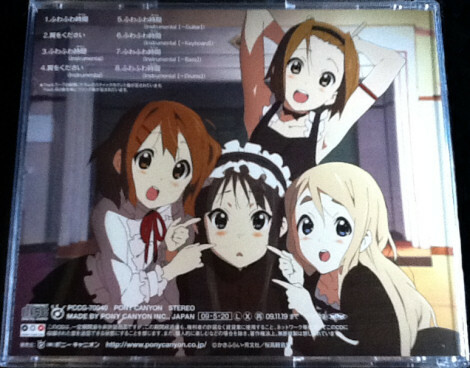 This CD single includes a full-length version of the song, based on the performance in episode 6 “School Festival!” with Mio (Yoko Hikasa) doing lead vocals, but with a more polished sound and with Yui (Aki Toyosaki)’s background vocals done straight rather than with the husky voice (a full length version of the “Husky voiced Yui” mix exists, but that CD was never commercially released and can be a little tricky to come by). The single’s B-side track is “Tsubasa wo Kudasai”. Not the short instrumental version played in the first anime episode (Remember that? Well, no, if you’ve only seen Bandai’s US version, you wouldn’t… Okay, okay, moving on!) but a full three minute version in an original K-On!-style “rock” arrangement with all four club members taking turns doing the vocals. Following that is the usual instrumental mix of both songs, followed by four additional instrumental versions of “Fuwa Fuwa Time”, each one subtracting one of the main four instruments. The CD single comes in a standard clear jewel case. The regular kind, not the thinner ones often used for singles. The cover insert is a simple four-page booklet, with the song lyrics and the credits found inside. The lyrics are done in a hand written style. One may wonder whose hand writing this is supposed to be. The CD itself is blank and shiny like CD’s tend to be, with no artwork aside from the cutesy “hand writing” style titles. There isn’t a whole lot more to say about this, I guess. The CD doesn’t come with a whole lot of bells and whistles, but the content is what’s important here. It’s “Fuwa Fuwa Time”. That in itself should be enough information for any K-On! fan to decide if this CD is worth getting or not.